Tommy Kirk and Tim Considine. I was probably too old to fully appreciate The Mickey Mouse Club by the time it was syndicated in my home town. Honestly, I don't think the Mouseketeers' musical numbers would have appealed to me at any age. And, in regard to the cartoons, I'm a Warner Bros. kind of guy. The serials, though, were another matter. Even the girl-centric Annette held my interest...because I'm an Annette Funicello fan. 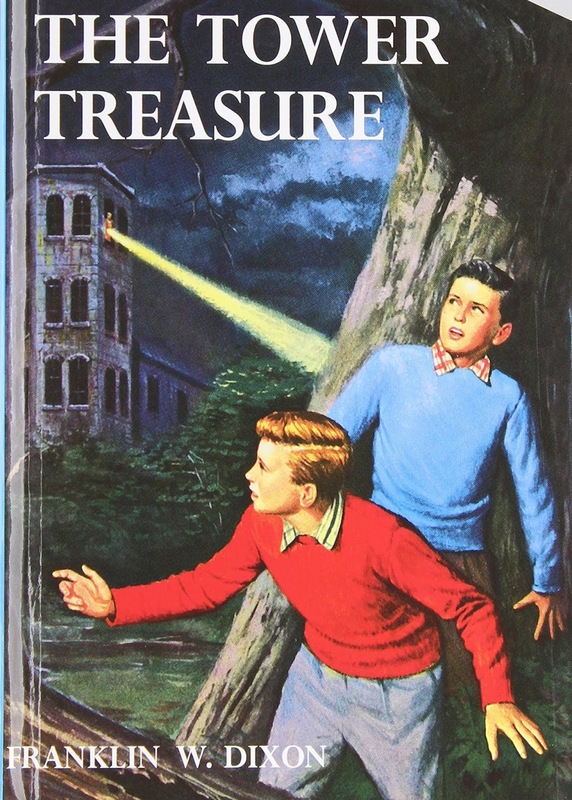 And then there were the Hardy Boys, which brings us to today's review. Edward Stratemeyer created teenage amateur detectives Joe and Frank Hardy in 1927. The boys lived in the small coastal town of Bayport with their parents. Their interest in solving mysteries was apparently inherited from their father, Fenton, who worked as a detective. For the initial books, Stratemeyer and his daughters Edith and Harriet wrote the plot outlines. The juvenile novels would then be completed by ghostwriters, who all used the name Franklin W. Dixon. Grosset & Dunlap published a total of 58 Hardy Boys mysteries between 1927 and 1979. These are considered the original novels, though the characters continued to appear in dozen of books after that (which featured changes in format, style, and settings). Frank, father Fenton, and Joe. The Hardy Boys mysteries were still immensely popular in 1956 when Walt Disney produced The Mystery of the Applegate Treasure, a 19-episode serial for The Mickey Mouse Club. It was loosely based on the first Hardy Boys book, The Tower Treasure (1929). Each installment of the serial was about 12 minutes long. For this adaptation, Frank and Joe were made younger and their mother was replaced by Aunt Gertrude. Their father worked in "the city," which accounted for his absence during most of the episodes. The Mystery of the Applegate Treasure opens with Iola, Joe's "girlfriend", spilling her purse after bumping into a new boy in town named Perry. That same day, someone steals Iola's purse. Joe recovers it and nothing appears to be missing. Perry turns out to be on parole (of sorts) from a reform school and is working for Old Man Applegate. He also lives in a shack on Applegate's estate. Sarah Selby as Aunt Gertrude. When some tools go missing, a plumber, who is doing work for Applegate, suggests that Perry is a thief. That night, Joe and Frank search Perry's room and find the missing tools. The police arrest Perry--but not before he asks for Joe's help and gives him a gold doubloon found on Applegate's estate. Later, Mr. Applegate recounts to Joe and Frank the story of how his "treasure" was stolen ten years earlier. Could someone be searching for the missing treasure...and trying to frame Perry? Or is the treasure just a figment of an elderly gentleman's imagination? The central premise of The Mystery of the Applegate Treasure is a promising one--hey, what kid wouldn't want to find a box of gold doubloons and pieces of eight? And the solution to the mystery, when it's finally revealed, turns out to be worthy of Agatha Christie. However, at three-and-half hours in total length, the serial is awfully leisurely at times. There are a few episodes in which nothing much seems to happen. Still, the cast is energetic and enthusiastic, with Tommy Kirk and Tim Considine leading the way as Joe and Frank Hardy. Kirk would become one of Disney's most reliable stars after appearing in Old Yeller the following year. Considine was already a teen star, having appeared as Spin in the Spin and Marty serials on The Mickey Mouse Club. The original Spin and Marty serial was so successful that it spawned two sequels. Considine went on, of course, to play Mike Douglas on My Three Sons from 1960-65. My favorite cast member, though, was Carole Ann Campbell, who played Iola. The incredibility sweet Campbell had only seven acting credits during her career. She played Lillian Roth as a child in the movie biography I'll Cry Tomorrow (1955) with Susan Hayward. Campbell recorded some songs on Kangaroo Records, but never pursued an acting career after a couple of TV guest star stints in the 1960s. The Mystery of the Applegate Treasure was successful enough to warrant a sequel, The Mystery of the Ghost Farm. It reunited Kirk, Considine, and Campbell, but was shorter (14 episodes) and not as popular as the first Hardy Boys serial. It has never been released on DVD. By the way, the opening credits to The Mystery of the Applegate Treasure feature an awesome pirate song warbled by Thurl Ravenscroft (the one-time voice of Tony the Tiger). The film footage was borrowed from Disney's own Treasure Island (1950). Fabulous way to start my Thanksgiving with the morning coffee and my head filled with gold dubloons and pieces of eight! I too caught The Mickey Mouse Club on syndication in the early 1960s and I loved every bit of it. (I've never had a problem mixing my cartoon studios.) The musical numbers helped inspire my love of and involvement in theatre. But my biggest dream would have been to spending summers at the Triple R or solving mysteries with Joe and Frank. i watched the Mickey Mouse Club when it was on the air - every day of the week - with my brother after school. All the kids we knew watched the MMC and it was a hot topic the next day at school. Loved the serials and I remember this one fondly, "Gold doubloons and pieces of eight, handed down by Applegate..." Tim Considine was an early crush, but I adored Tommy Kirk who seemed most like "a real kid." An autumn favorite! Great choice for October, Rick. I love Florenz Ames' performance as Old Man Applegate and the entire ending sequence by the railroad is great fun. I recall reading that this series was deemed "too scary" by some adults and so the second Hardy Boys installment was tamed down, which is a shame because Ghost Farm really had no punch to it at all when it could have been equally as entertaining. I'd like to watch GHOST FARM. It's on YouTube, but the quality isn't very good. How about a shout-out for the screenwriter here? Jackson Gillis came to Hardy Boys more or less directly from George Reeves's Superman - and went from it to a lengthy tenure as a principal writer for Perry Mason. From the '50s through to the '90s, Jackson Gillis wrote for so many shows that we who read this site grew up with - and grew into. Jackson Gillis was the writer of record for "Suitable For Framing" on Columbo - still considered that series's best-ever finishing clue. Check for yourself (it's the Ross Martin show). I was always a Tom Swift (junior) kid. But I discovered the Hardy Boys from Disney TV and found the series highly entertaining -- and Spin and Marty as well. Indelible memories. I'm always pleased when you reach back and find these old "treasures." My Dad had some of the original Tom Swift books and I enjoyed those. It's interesting that no one has turned those into a movie or TV series. This sounds like a lot of fun. I had no idea there was such a series. What a treat for mystery-minded kids! What a fun serial! I loved singing along with the “Gold doubloons and pieces of eight” song. And the search for buried treasure? Awesome! Blacula Is "One Strange Dude"
The Longest Yard: "It's just a game."